The Forest! – Tembea With Lulu. On Friday the 13th of April, I took a trip to Kereita Forest, which is in Limuru. I went to visit a not so known place (which is a shame because it’s amazing) called The forest. It’s just what it is, a forest. And, surprisingly, has the longest zip line in East Africa! Cool, right? Apart from that it has a couple of other activities, like: mountain biking, paint balling, nature walks, horseback riding, foot golf, camping, tree planting, team building, fly fishing and archery. 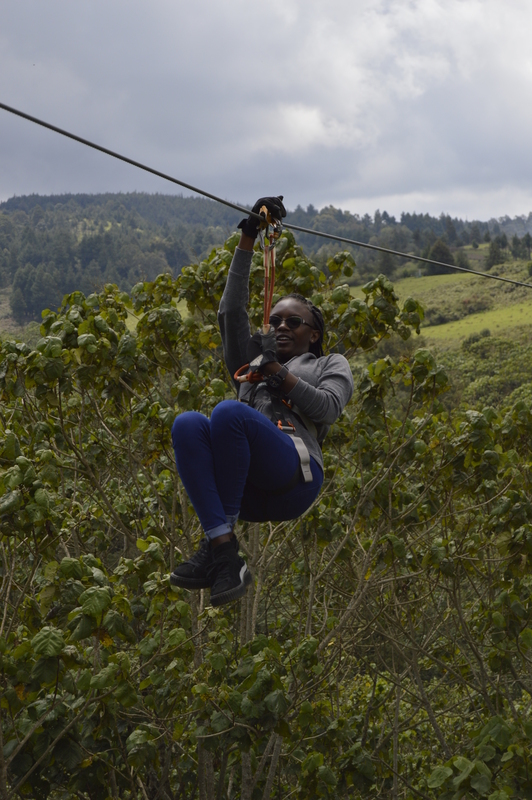 There are a couple of packages, I would best recommend the full zip line tour which is ksh. 2800 per head. There also weekday specials. It’s closed on Mondays, apart from public holidays. All this and more info can be found on their website, Click here to go to the website. After each one of us had done a practice round down the short line, (I had to do it twice because I couldn’t brake well the first time) we went to the first line, and because my mom and I were doing just two we went first. For me, it was CRAZY. Well at first. Here’s how I felt; AAAAAAAAAAAAAAAAAAAaaaa…. oh, okay, WOW, THE VIEW IS AMAZING. Then before I knew it I was done. My adrenaline was pumping, the guy at the end was asking why I was breathing heavily and I barely even switched position. I’ll leave the rest to your imagination. After the two lines we walked a little, up hill and my unfit chest was already heaving. Then we went to do some archery…. To be honest, I never thought there was so much of any formula to drawing a bow and shooting an arrow, but turns out there is. Before we started the archery instructor showed us how to hold the bow, how to load it, the right way to stand (upright and 90 degrees from the target), how far to draw the bow (right before your left eye) and how to focus. It was so much fun. We went on for an hour, and we did a competition as well. As soon as we were done we headed back up to have lunch. I was starving after all that, and the food the served did not disappoint at all. The food was really good, it was some sort of buffet. I had roasted potatoes Grilled chicken and ‘Nyamachoma’ with BBQ sauce. After all that, it was finally time to leave, we had to get going before the clouds broke and the rain fell. It was really a memorable experience and I would highly recommend. It’s ideal for team building, bonding with your friends or family, or you could go by yourself and make some new friends as well. I’m definitely going back, this time to do all the six lines and maybe paint balling. Don’t forget to go check out their website, Click here to go to the website. Previous Happy Global Warming Season! The pictures make it a whole lot better and gives one a mental picture of everything.